There was no shortage of good news for MongoDB recently. Red Hat started to include it in its Enterprise Linux distribution, lots of high profile companies started using it for their big data applications, and even mighty IBM recognized MongoDB by integrating their JSON-based protocol into some of their own products. Now we can add to these good news, as MongoDB reached rank 6 in our ranking of 189 DBMS systems, overtaking Microsoft Access. 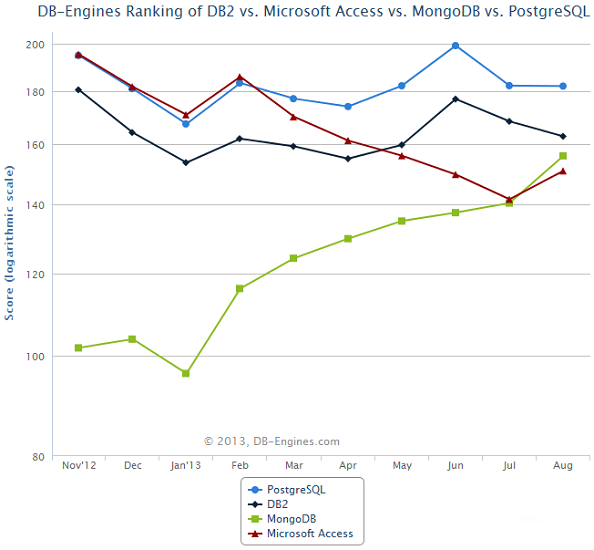 Microsoft Access is hardly a direct competitor of MongoDB, they live at quite opposite corners of the DBMS space. Nevertheless, when measuring the popularity, Access has enormous strength. Being around for more than 20 years as part of the hugely popular Office Suite and backed by Microsoft's marketing machinery, it is as close to a household name as a DBMS product can get. Compare this to MongoDB, with an initial release in 2009, it's a name that even many IT professionals have never heard of. It's even more impressive that in the categories that we use for our ranking, such as job offers, professional profiles and search engine trends, MongoDB is so well represented. I'm not sure whether some people at IBM are getting nervous after they have strengthened MongoDB by using their protocol. I might not be the only one that looks at the trend chart above and thinks: DB2 will be next.